(CNN)– The DNC’s unity tour this week, headlined jointly by party Chairman Tom Perez and Vermont Sen. Bernie Sanders, has gotten off to a rocky start. From the “Come Together and Fight Back” tour’s kickoff rally in Maine on Monday, Democrats witnessed that old habits die hard. When the leader of the Maine Young Democrats asked the crowd what brought them to the rally, the audience erupted in “Bernie” cheers. The leader followed up by asking, “Maybe you came through because you are curious about the new DNC chairman and the future of Democratic politics?” — and the crowd cut her off with boos. Things moved downhill quickly from there. During a joint interview with MSNBC‘s Chris Hayes on Tuesday night, Sanders said he does not even consider himself a Democrat. “I am an independent,” Sanders affirmed. The self-identified democratic socialist serves in the Senate as an independent, although he caucuses with the Democrats and ran in the Democratic presidential primary last election cycle. After his defeat in the primary, he endorsed Democratic nominee Hillary Clinton and campaigned for her. On Monday, Sanders kicked off the red-state tour with Perez, who narrowly defeated Sanders’ preferred choice for the job, Rep. Keith Ellison of Minnesota. Perez and Sanders’ differences were somewhat apparent in the Tuesday interview. On health care, Sanders called for a “Medicare-for-all” approach, and Perez stopped short of endorsing that policy while saying he believed health care should be a right. 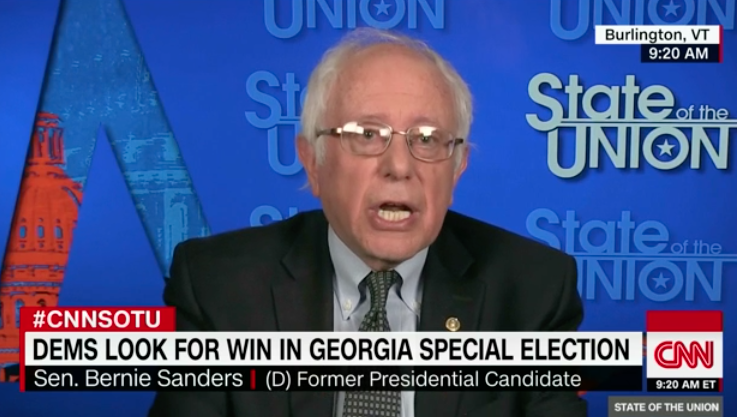 Sanders railed against “the ruling class” and said voters needed to hear that. “Your greed is destroying this country, and you know what? We’re going to take you on,” Sanders said. “When we put hope on the ballot, Chris, we win,” Perez said. He went on to attack President Donald Trump’s economic message. The crowd’s reception was so positive, however, he now uses the phrase frequently enough that the DNC website sells T-shirts with a similar saying. The DNC plans to continue the remainder of the tour with a focus on “shared values of inclusion and opportunity,” a spokesperson said. The party’s tour continues this week with visits to red and purple states, including Arizona, Florida, Kentucky, Montana, Nebraska, Nevada and Utah.